Before joining the Block Group, Bert Gillette had an impressive career as a nonprofit executive. Early in his career, he developed outdoor science and adventure programs for students before transitioning to building therapeutic recreation programs for veterans who are transitioning back to civilian life. In his interview, Bert tells us about why the Block Group brings his nonprofit and realtor passions together and how he continues to serve the Denver community by supporting first-time homeowners. Where do you live in Denver and why did you choose that neighborhood? I currently live in the Hilltop neighborhood by Cranmer Park. I love so much about that neighborhood—the park, the sense of community, the feeling of having neighbors and open space. It's crazy because you're right there on Colorado Blvd but as soon as you're a block off, you don't feel anywhere near the city. It's quiet. You've got all ages there. I like door knocking. Now that my neighbors and I have a rapport, we talk together whenever see each other. How did you start out in real estate? I'm a very field-oriented person, and I like working in a community. A handful of people told me I'd enjoy real estate. I wasn't sure but I figured, "If I get my license, it'll probably save me in the long run." I was pleasantly surprised. I found a way to be your own boss, be in charge of your own destiny and continue to live my passions and find different people to do business with. I worked in recreational therapy for 15 years and still volunteer with therapy agencies. With real estate, I can still serve my community and, at the same time, work toward my personal goals. Why did you start choose to join the Block Group? It's that service, that sense of community that inspired me to be on this team. I feel like if you're not giving back to your community, you're doing a disservice to yourself and the community. When I asked each real estate company what they did for their community, I didn't find a lot of satisfying answers. At the Block group, I found out that each month they picked a cause and held a community event which not only raises community awareness but also funds. It felt like a good place to leverage some of my background as well to build a new community. I feel like it's the model of the future. People want to do business with people who are helping others. What’s your favorite thing about working in real estate and supporting clients in home ownership? I love that I can make my own schedule instead of punching a clock somewhere. I'm also a very social person. I like running around knocking on doors and meeting great people. Helping people navigate through the bumps of their first home is a gratifying experience. Some home sellers face adverse circumstances, so to help them transition satisfies my supportive side. Can you tell us a specific story about a first time homeowner that you were able to help? You've created a series of videos called Hometown Heroes. What is your goal with that series? Every other week, I find a business that supports a cause or a nonprofit organization. I go and interview them. I create a two-minute interview that raises awareness of folks who are rolling up their sleeves to make Denver a better community. It's a triple win. It brings attention to good causes in the community, it helps establish their brand, and when everything goes well, it raises funds for good causes. What advice do you have for homeowners to help them be successful in the Denver market? The big thing is to prepare. Many people know a move is coming up but it’s hard to start. If you have the luxury to do so, plan 6 months out. The people who take their time, learn their market and see what they can get for their money have the easiest time finding the right house. They can say, "That's the one. We're done." It's nice when it goes that way. Born and raised in San Diego, CA, Katie White first came to Colorado on a post-college trip to visit her cousin. That first visit was love at first sight, and she found a job and house in Denver within a week. Katie’s natural affinity for customer service led to success in her roles in event planning, recruiting and sales. In the Block Group, Katie brings warm energy and a hardworking drive to all she does, whether setting up a costume swap or guiding clients through the home buying process. Get to know her more in our questions below! What sets you apart as a Realtor? I love helping people, but I also appreciate the challenge of real estate. I love working with diverse people to find the right home for them, and I firmly believe that anyone can find a dream home! I understand how emotional buying or selling a home can be and I pride myself on being there to walk my clients through every step and really listening to their needs. We found our dream home at Ken Caryl Valley. Our community is completely cohesive, like the neighborhood I grew up in. There’s even deer in your front yard! And I believe that’s possible for my clients. You have to figure out your must-haves and then look for places that match that. What’s best for you or your family that also feels like home? Both you and your husband love the outdoors. Yes, my husband is a mountain man who wants to climb Mt. McKinley, the highest peak in the U.S., and we named our daughter after that mountain. Hopefully, she’ll love the outdoors as much as we do. We met up at the Denver Beer Company, and of course I brought my dog for protection. My dog liked him, which was good. And then we went to a costume party that night, since that’s one of my favorite things to do. He dressed up, and I was so impressed. We had a great time, and we’ve been together ever since. How did you choose a career in real estate? Real estate allows me to have a life—to be a career woman and stay home with my daughter. My parents are both hard workers. They’ve worked our whole lives to help my brothers and I have a great life—from supporting our education to being grandparents. I’ve always looked up to them being married and committed as long as they have—almost 50 years. What aspects of your personality do you draw from your parents? My dad is one of the most genuine, honest, kind-hearted and giving people I’ve ever met. He would give you the shirt off of his back if he knew it would help. He’s a complete caretaker. I get helpfulness from him. I try to be available when people need me—no matter what time or day. I want to be a supportive friend, and I get that from him. What inspired you to think of Blocktoberfest and Costume Swap? I absolutely love the fall and Halloween. Ever since I can remember I’ve loved to dress up. I’ve kept every costume I’ve owned for New Years or Halloween, which now probably adds up to 4 costume bins. My friends come over just to find something to borrow. Now that I have a daughter, I have some fun things I want to keep, but I also want some of these costumes to go to people who are going to appreciate them. You want them to go to people who enjoy them as much as you did! We wanted to do something in the community that celebrates the season. We also wanted to have something fun for both kids and adults to do, as well as help out a local nonprofit, which is JeffCoEats. Reach out to Katie at katiewhitere@gmail.com to talk about buying or selling your home! Say hello to the newest Block Group team member—Maryna Fitzgerald! Maryna comes to our team with a passion for downtown Denver. Her love of people and approachability make her an excellent Realtor® to work with. Find out more about her in our interview below. How did you choose to work with Innovative Real Estate? I knew real estate was a very competitive industry, so I wanted to be with the best. I spoke with my friend Natasha Byalskij, a commercial real estate agent, and she told me I had to go with Berkshire Hathaway HomeServices. I worked for oil and gas companies as a petroleum engineer and financial analyst. My job was handling production for oil and gas companies, everything from financial modeling to project management. How do those skills help you in real estate? When I managed projects before, I had to figure out the various resources and human resources needed to complete them. I became comfortable picking up a phone and talking to anyone. I like people, and I’ll always find a way to accomplish my job. Why do you focus on downtown? I live in downtown Denver, and I’ve been here for 9 years after moving from the suburbs. It took me awhile to adjust to living downtown, and I think that’s a common problem for newcomers, especially with Denver growing so fast with new restaurants, new entertainment, and new buildings. I’m excited to work with clients who move to Denver from a different state, so I can show them what they can do downtown and how they can enjoy urban life. What are your three favorite things about living downtown? It’s convenient. Everything I need, I can find downtown. It’s healthy because you walk everywhere. You never get bored with so much entertainment. There is always something going on: comedy, jazz, performance arts, baseball—even football is only five minutes away. At the same time, like most places in Denver, you’re really not far from the mountains. Is it difficult to buy real estate in downtown Denver? People talk about shortages, but I don’t think there is a shortage unless you want to live in a high rise. Many smaller buildings have available condos and townhouses. (Two buildings next to mine actually just opened up multiple condos!) You have to patient. Everyone still wants to live downtown, and that won’t change any time soon. My friends and people I hang out with are my heroes. It doesn’t matter if they are great moms or inspiring entrepreneurs—I respect people for their different accomplishments. Look at Genie on our team. She started out shining shoes and has become a successful realtor. I like people who set their mind to something and make stuff happen. What do you like to do besides real estate? Well, I love to go out and meet new people. But coming from Eastern Europe, if you see any kind of water, you have to get in. I love hot springs, and many years ago I decided to visit every hot spring that I could find in Colorado. I’m pretty sure I have been to them all! Join Maryna and The Block Group team for a special downtown networking happy hour at NATIV Hotel on Friday, September 7, 2018 from 6–9 p.m. Tickets here! Kelly Dickens knows how to work. “My husband is an entrepreneur as well,” she says, “We just work, work, work and play when we can.” She was a hard worker even before becoming a real estate agent, teaching Spanish and ESL for nearly 10 years. Today, even with a 16-month-year old son, she manages to support her clients through every stage of the home-buying or selling process. What was it like to transition into real estate? I always loved houses. My grandparents and brother were realtors in California, so it’s second nature to me. And my husband is a contractor, so I have a healthy knowledge of the interior and exterior of homes. After teaching for so long, I was just ready for a change. Actually, the main reason I’m in real estate is because my realtor was amazing—we’re still good friends. She and a few other smart people influenced me to make the change. In January 2017, I signed on with Innovative Real Estate just as they came under Berkshire Hathaway HomeServices. I closed my first transaction in Arvada ten days after having my first baby. Can you imagine? I was in labor handing clients off to other agents because I was headed to the hospital! What are your top recommendations to people trying to buy a home in the Denver market? Get pre-approval and find a good agent. Narrow it down by geography. Be willing to make a decision. Know your budget and your money. Your number one asset in purchasing a home and get to the closing table is your ability to make a decision. Some people waffle, and in this market there is no room for going back and forth. You will always compromise on space and location, so buy the house you want to live in for the next 10 years—comfortably. Home is a feeling, not just a brick and mortar building. It’s where you make your memories. I live in Bear Valley in Southwest Denver. I love its access to Red Rocks and its many parks. You can quickly be downtown or on your way to the mountains. Why did you choose to highlight Great Work Montessori School at our upcoming Film on the Rocks event? I believe in the inclusive mission of the school. Montessori schools can be inaccessible and expensive, but the goal of this school is to provide Montessori resources to all. We are adopting a fourth-grade teacher Rachel Feres her classroom. Great Work is a newer school, so they can use community support. We’re helping with her build out a library with leveled books so that all of her students can read at their level. Any additional money we raise will go toward arts and science supplies. Most definitely my mother. She has helped me stay strong, positive, and caring. My dad Barry was always business savvy and a salesman. A lot of my professional training—how to treat people, what to read—initially came from him, and I am so grateful for that perspective. My biological dad is no longer with us, but he was an amazing, humorous man. And my husband inspires me to work hard. What was it like to become a mother? The one thing that no one prepared me for is how your hearts just aches­—at least for the first six months. You look at the world a little more tenderly, and you look at people with a little more grace and love. You drive cautiously. You speak eloquently. Everything you aspire to become is what your child witnesses. Knowing that you always have little eyes and ears on you makes life a little bit richer All of those Hallmark clichés come alive. And the love you see in your spouse is special. It makes me want to fall in love all over again. My husband would laugh at everything I’m saying, but it’s true. 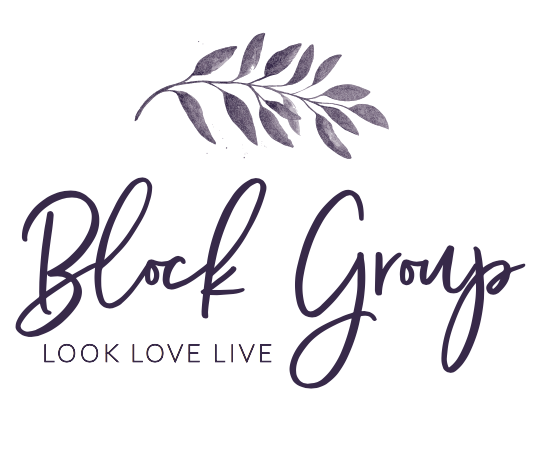 What is your favorite thing about the Block Group? I love the energy of Genie and Heather. I love that we give back to society as much as we can through volunteering and giving to nonprofits. And the main reason I love working here is the culture at Innovative: the honesty, integrity and extreme professionalism in everything we do. Maurice joined the Block Group in February 2018, though he’s been with Berkshire Hathaway HomeServices for two years. He chose the Block Group because he wanted to be part of a collaborative team that had the capacity to host fun events and that had the experience and relationships that would help him grow as a REALTOR®. My daughters are great girls. Our favorite things to do together are reading books and exploring Colorado through hikes and visiting parks. They’re 12 and 6, both born on the same day in April. My oldest is a little more of a thinker, while the younger is more of a dreamer. They’re both very active. When they’re not reading or playing on their devices, no one can slow them down, and by that I mean, they’re FULL of energy—jumping, playing, making new friends. How did you choose Lincoln Park as a neighborhood? My fiancé, an aerial circus artist, was training at Awaken Gym all the time. We were visiting the neighborhood so often that we fell in love with the people and the culture. I really love the people. It’s one of the few places in Denver with both a strong Hispanic culture along and an arts focus. We love its historic character. First Friday Art Walk is always fun! We often go to The Molecule Effect because it’s right by our house. I love the atmosphere at the place—how they rotate artists every month. Their staff and owners are respectful with great service. Outside of our neighborhood, our favorite thing to do is waterfall hikes. The girls love it. If we’re in town, we enjoy visiting Edgewater/Sloans Lake. Our family’s top restaurants are US Thai (probably the best Thai in Denver) and Edgewater Pizza. Williams & Graham in the Highland neighborhood is our favorite place to go if we do get a drink. We’d start out with breakfast at Denver Biscuit Company, go out hiking somewhere like Eldorado Canyon State Park, come home and watch a movie at Alamo Drafthouse, and end it with a walk near the South Platte River or Sloans Lake. The key components of a perfect day for me are being outdoors—ideally around water—and enjoying people. What do you love most about being a REALTOR®? I love connecting with people and finding a house that fits them, not just their needs but their hopes and dreams. What is their family vision? How does this home play into their vision for their lives? The search is fun. Denver Metro is large, and as you search for homes, you learn unique facts about each area of the metro. Each neighborhood or town offers something special. What are your real estate specialties? I specialize in millennials and younger families. At least, I’ve been working with them the most so far. With younger families, you’re looking for their first home, which is such a big step. Denver has many home styles, so it can be challenging to find the right fit for each family, but the challenge is fun. Millennials are the next generation of people ready for homeownership. Helping them realize their dreams—whether that’s a condo, a townhome or single family home—is probably the most rewarding part of my business. I’d like to be famous for making a difference in the world in a positive way—bringing prosperity to more people. Our country has so much opportunity that not everyone taps into. Helping people tap into that opportunity and into the American Dream inspires me. Kylie McKay knows how to give her absolute best, whether she’s managing the needs of her family with two young children or the details of a real estate transaction. It’s little surprise that she earned the Denver Metro Association of Realtors Rising Star Award during her first year in the biz. The Block Group is proud to promote Kylie to Team Manager. Her attention to detail makes her an excellent advocate for her clients, and her personal discipline and organization makes her an excellent leader. Our team recently shared a laugh as we recalled receiving emails from her to reschedule meetings—while she was in labor! We sat down with Kylie in advance of our Furry Scurry fundraiser to hear her story. I’ve been helping buyers and sellers with their real estate transactions for almost three years. I was one of the original members of The Block Group, starting with Heather at the end of 2015. We moved here from Austin, Texas five years ago for my husband’s job with Aramark. Even though I had never been to Colorado, I trusted my husband, who is partially from here. He has a lot of family here so I knew the transition would be an easy and enjoyable one. I’d have to say my own—Highlands Ranch. I love it because it’s very family friendly. I have a two-year-old, a newborn, and a dog, and Highlands Ranch has everything we could possibly need—dining, shopping, entertainment, dog parks, recreation, you name it! Do you specialize in any particular real estate markets? Which causes do you care about most? Anything to do with family. I was raised in such a loving family. Even though my parents divorced when I was four, we would always celebrate holidays together as one family. My parents would also carpool together to my brother’s and my sporting events. It was such a supportive family, which is very important to me. I also absolutely love dogs, which is why I wanted to fundraise for the Furry Scurry. Dogs are such an important part of my life that I can’t remember a time when I didn’t have one in my home. They demonstrate trust, loyalty, and true companionship. I can have a hard day, and petting my dog can instantly make me feel so calm. In my opinion, animals can be just as integral in a family as children. My dog is also very patient with my two-year-old, who is currently a rambunctious toddler. Even though he pulls her tail and crawls over her, she’s never done anything except lick him on the face. You’re a very dedicated person. Where do you think that character trait comes from? I believe it stems from my childhood as a competitive gymnast. I was very dedicated to working hard, improving my skills and abilities, and being the best I could possibly be. From a very young age, I would get out of school early to be at the gym by 1pm for a 5-6 hour practice, 5 days a week with competitions on the weekends. I had to be focused, organized, and dedicated with that lifestyle, which has continued into my adulthood through family and my career. I love being outside, from a low key day in the backyard—planting vegetables in the garden or even doing yard work—to a day in the mountains skiing and hiking. Growing up in Washington State, I had a serious lack of sun. I love that even when it’s a little chilly in Colorado, you can still enjoy the sun and outdoors. Imagine you woke up tomorrow with a new ability or skill. What would you want it to be? I’d want the ability to let things go, to be able to more easily say “I accept what happens” and move on. I’m so dedicated to helping people, and when things don’t pan out, I get down on myself. In this business, you have to be able to move forward, so that would be the quality I would love to have. Kylie’s clients have great things to say about her work! Click here to read testimonials from buyers and sellers. If you’re interested in working with her, contact her directly at kylie@blockregroup.com or at 303-597-6550.